The Oilers play the Boston Bruins on Saturday night. The game can be seen on Sportsnet West starting at 11:00 a.m. MST. 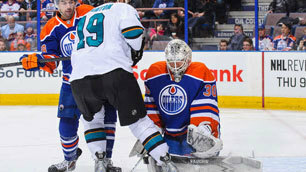 EDMONTON, AB - Fans in attendance for the Edmonton Oilers and San Jose Sharks game on Wednesday night witnessed National Hockey League history as goaltender Ben Scrivens broke the record for the most saves in a regular season shutout in league history. Chants of ‘Scri-vens, Scri-vens’ roared through the Rexall Place crowd along with multiple standing ovations as the Oilers goaltender electrified, stopping 59 shots in a 3-0 shutout win over the Sharks. Scrivens’ performance left his teammates in awe. Despite being outshot 14-3 halfway through the first period, the Oilers were the first to get on the board with their fourth shot of the night. Justin Schultz scored his second goal in three games when he lined up and fired a perfect shot from the point past Antti Niemi to give Edmonton the 1-0 lead. Hall and Nick Schultz earned the assists on the goal at 10:51 of the opening frame. With under a minute to go in the first period, Oilers newcomer Matt Hendricks and former Oiler Mike Brown dropped the gloves and squared off in the home team’s defensive zone. That tilt would close out an opening 20 minutes in which the Oilers were outshot by their opponent 20-7, but maintained a 1-0 lead courtesy of goaltender Ben Scrivens. Scrivens continued his stellar play in the second period when he had a string of spectacular saves just over halfway through the frame. He earned a standing ovation after his 33rd save of the night, with about 11 minutes on the clock. The Oilers goalie, acquired from Los Angeles in a trade on January 15, had a previous career high in saves of 40, set on March 26, 2013. Scrivens had 42 after 40 minutes of play. At 6:10 of the third period the Oilers helped out Scrivens with some goal support. Jordan Eberle set up Hall backdoor on a 2-on-1 rush and he scored his 19th of the season. Ryan Nugent-Hopkins earned the secondary assist and Eberle’s helper was his 200th career NHL point. Eberle sealed the deal for the Oilers as he pounced on a loose puck in the crease and put it home at 18:40 of the third, on the power play. Nugent-Hopkins and Hall had the assists. Scrivens also set an Oilers franchise record with his performance. The previous best for most saves in a game by an Oilers goalie was 56, set on March 17, 1993 by Bill Ranford. Scrivens was humble in his post-game interview session.